The biggest, noisiest and probably the most fun, The Reggae Bar on Phi Phi Island is more of an entertainment complex. Measuring 25 meters by 75m it's getting near the size of a small football pitch and when it's busy..... boy is it a big night. As many other smaller bars on the island close up 9 times out of 10 people move on to the Reggae as it seems to lift at about 12pm. The energy, the dancing is intense.... the night rolls on to morning. The Reggae Bar started as the Harmony Bar in 1997 on the main street to view point, 30 meters from it's present entrance. As a simple bar it created a modest following. When the contract on the lease came up the Owners Pi Owen (Mr Fat's) and Wina bought a lease on the side of the hill and made the Reggae. All local people thought they were crazy to build on a hill as they thought nobody would walk up hill. How wrong they were. The bar got so busy they leased the land in front of the bar. They have tried a restaurant "Marleys" which didn't quite hit the mark but apart form that small set back everything they have done has brought success. 2010 Jan. 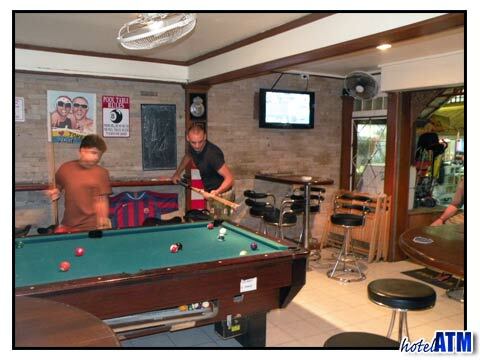 In the ever evolving Reggae Bar the guesthouse has gone as there are too many hotels and resorts in Tonsai and The Reggae Bar focuses on Thai boxing and a bit of the football showings. Now you can put on some gloves and try a bout for yourself and this has proved very popular and entertaining. 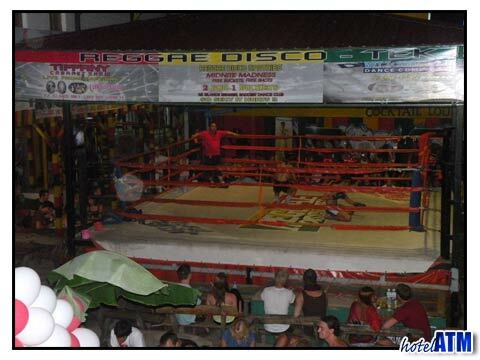 Boxing and Partying every night at the Reggae bar at Phi Phi Tonsai Village. Don't miss out...!